Sergeant Alfred Howell was a native of Aberystwyth, the son of Alfred and Sarah Howell of Glynbwch, Crosswood (near Llanafan). He worked as a butler and valet in Staffordshire before emigrating to Canada with his wife Harriet in 1910. Before the war, he worked in a foundry in Toronto as a bench hand. He enlisted to the Canadian Overseas Expeditionary Force on 3 April 1916 in Toronto. His recruitment card shows that he was 36 years and 2 months old, 5 ft 7 ins tall, and had brown eyes and dark brown hair. It also shows that he had served in the military previously: 6 years as Corporal with the 19th Hussars, 6 years as Bomber with the RHA (Royal Horse Artillery?) and 5 years as Private with the GGBG (Governor General's Body Guard?). Before going to France he served as an instructor to Canadian troops in England. In 1918, he was sent to France with the 54th Battalion, Canadian Infantry, and fought in the Battle of Amiens. After only five weeks of active service, Sgt Howell was killed in action on 2 September 1918, aged 38. 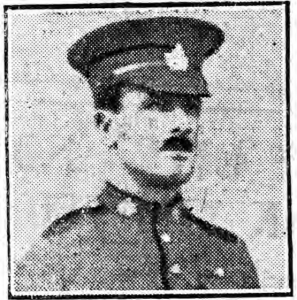 Crosswood Sergeant Killed - Article in Cambrian News and Merionethshire Standard on 4 October 1918 regarding the death of Sgt Howell. Attestation papers - Attestation papers of Sgt Howell with Canadian forces (Library and Archives Canada).